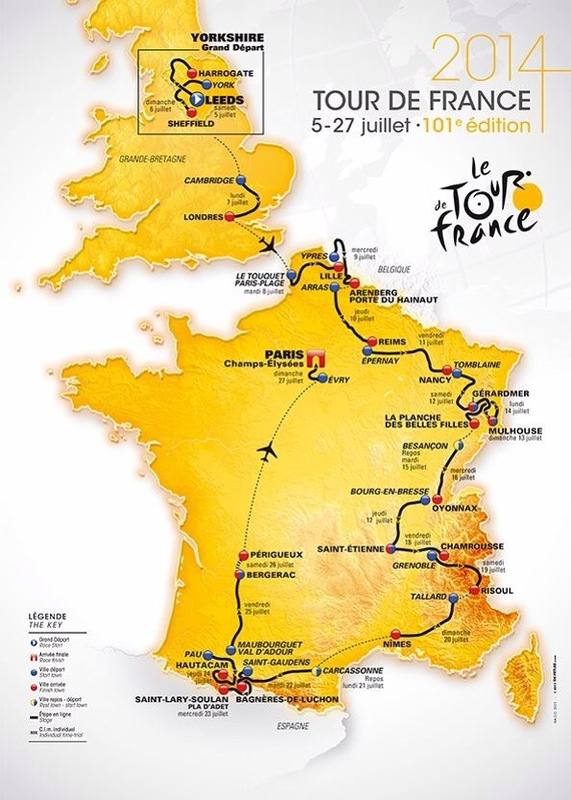 With so much focus in this country on the Grand Départ it has been hard at times to remember that there will be a further 18 days of racing after the world’s biggest cycling cavalcade leaves our shores. I have been as guilty of this as anyone by focussing my thoughts almost entirely on the opening two stages in Yorkshire and the Stage 3 run from Cambridge to London. Everyone is talking about the ‘destiny ‘of Mark Cavendish to win the Maillot Jeune in his mum’s home town of Harrogate and wondering how much damage the fearsome Côte de Jenkins Road will do in the final few kilometres into Sheffield the following day. I think we are suffering from a touch of yellow fever that is clouding our ability to see beyond this weekend. It’s fantastic that we have so much to discuss about the short time the Grand Boucle is with us. But what of the rest of Le Tour? We often talk about ‘ages’, ‘eras’ and ‘generations’ in cycling. The Golden Age, The Merckx Era, the EPO generation.. A generation in the pro-peleton seems to be about 10 years; survive longer than that and you are firmly part of the ‘old guard’ – grizzled by the many campaigns and injuries, worn down by the relentless mileage. Perhaps you are afforded a little bit of extra respect; a moment out on your own at a significant point in the race before being swallowed up again by the relentlessness of the youth and vigour behind you. It’s a dog eat dog world out there. Just ask David Millar. The Tour de France as a whole will pay its respects to a generation this year. Not a golden generation whose victories are writ large in the annals of the sport but rather a Lost Generation whose misery, suffering and sacrifice are writ far larger on the very landscape that the race will travel through. The centenary of the start of the First World War weighs heavily on the 2014 Tour route and the names along the route of the first week in France (and Belgium) are synonymous with industrial-scale battlegrounds and the harshness of trench warfare: Ypres, Passchendaele, Somme, Verdun. The casualties associated with these mournful names are almost inconceivable with some daily figures outstripping the entire losses for protracted, nation-defining conflicts such as the American war in Vietnam. More than a million men died or were injured at each of the Somme and Verdun campaigns alone. One hundred years on, the landscape still bears the scars of those four short, terrible years and still regularly gives up yet more unfound bodies. The Yorkshire start and the extended time spent around the WWI battlefields of Northern France has given the route a curiously lopsided look once in la belle France. It circumscribes a clockwise crescent shape from Le Touquet on the Channel coast around to Perigueux in the Dordogne, by way of the Vosges, Alps and Pyrenees. The Atlantic Coast of France misses out completely this year. As usual the final stage heads into Paris and ends with circuits of the Champs Élysées. There is no Prologue or Team Time Trial in this edition and the single 54km Individual Time Trial is the day before Paris. Saturday 5th & Sunday 6th July. If you aren’t out on the roads of ‘God’s Own Country’ this weekend watching the riders tackle the wonderfully named climbs such as Cote du Blubberhouses and Cote du Buttertubs, then do not miss the Yorkshire stages on the telly. ITV are showing coverage of the full race – a very rare occurrence – so it will be a chance to revel in all that beautiful landscape and to see how those early breakaways are formed. There is no British interest in the Wimbledon matches going on so there is no excuse! Can Cav bag a yellow jersey? Will there be sheep on’t road? It’s going to be fantastic finding out. Ypres – Arenberg Porte du Hainaut. 155.5km. Cobbles. Shouldn’t really need to say more but putting Grand Tour climbers and bunch sprinters over the pavé of the Hell of the North route will make for compulsive viewing. Someone will most definitely lose their shot at winning the whole thing there. The question is who? Mulhouse – La Planche de Belle Filles. 161.5km. Because Bastille Day falls on a Monday this year the first rest day has been moved to the Tuesday instead and the Tour Organisers have cooked up something special for the occasion. Six catergorised climbs feature in this seismograph of a stage profile. The Vosges mountains are far less famous than their more Southern brethren but this will be a sufferfest and will give the true indicators of the all important team strength. The stage finishes in La Planche de Belle Filles with it’s wicked 20% ramp at the very top of the climb. This is where Froome took his maiden Tour stage win in 2012. He will be looking for more of the same here to re-assert his dominance which has looked far less emphatic this year. Expect a couple of Frenchman to be way up the road to act as a lure for him though. Friday 19th and Saturday 20th July. Two stages in the Haut Alps bring the first hors category climbs of the 2014 Tour. The summit finish Chamrousse is an 18km long slog up a 7.3% average gradient which will decimate the peloton. the following day is a classic Alps route taking in the Col du Lautaret and the Col du Izoard before another summit finish at Risoul. The Izoard is known for forging legends of the Tour – men like Bobet and Coppi, who swapped ‘ownership’ of the Izoard for 6 years from 1949. Barren and desolate in places it last featured in Andy Schleck’s incredible long range solo victory in 2011. Whether a GC contender will need to make a similarly audacious move this year across it’s ragged rocks remains to be seen. The third of the ‘paired stages’ that have highlighted, these two are quite different from each other but will represent the last chance for those who need to gain time before the Time Trial to make their moves. So close to the end of the race there will be many riders and teams desperate to just make their marks. Expect twin races for stage wins and GC battles as multiple climbs across the second half of the days will encourage breakaways. Stage 18 features two giants. The Col du Tormalet and Hautacam. The Tourmalet is the most climbed pass in the Tour – famously first appearing in 1910 and causing Octave Lapize (one of 3 Tour winners to die in WWI) to utter his famous phrase, “You are murderers. Yes, murderers!” at roadside officials. Hautacam has only appeared five times previously but is no less infamous. Although he did not win the stage, the mountain is indelibly linked with Lance Armstrong taking the Maillot Jaune in wet conditions in 2000, consigning chief rival Jan Ullrich to the status of nearly-ran. If Froome wins here, expect a barrage of unfavourable comparisons. If Tony Martin has made it over the mountains (and going on his form in the recent Tour de Suisse there is no reason not to expect this) then he rightly start favourite for the stage. But he has been pushed close by others this year and was beaten by Froome in the Romandie ITT. I expect that the GC battle will be no means sorted coming into this final day and the work that Contador and Valverde have done on their time-trialling could yet be a factor. The form book says that the podium should be a straight three way battle between the two Spaniards and Froome. Valverde had an immense early season and has been resting for almost two months in readiness for this. Contador has looked resurgent this year after often riding like a sick ghost in 2012. He will attack and his tactical racing brain is as big an asset as his climbing. How much he will miss Roman Kreuziger – suspended for blood anomalies – will have to be seen. Froome is still the bookies favourite but intermittent racing, injuries and internal wrangling at Team Sky can only have unsteadied his ship. This will either sink him or free him from the rigidity of ‘The Plan’ to make his own mark on the race. Nibali has focused his whole year around the Tour, even foregoing the Giro to give himself the best chance. I just can’t see it though. Andrew Talansky of Garmin wore the white jersey in Paris last year but only because Nairo Quintana took the King of the Mountains accolade. His form looks to be spot on at just the right time with his Dauphiné win being snatched from under the noses of Froome and Contador. Could he do it again? Last year Belkin were very strong almost to the end with Bauke Mollema and Laurens Ten Dam pushing for podiums until the final couple of race days. With the sponsor pulling out and the riders giving the team until the 29th to find a new one, they will be riding for not just this year’s Tour but also for 2015. And let’s not forget Lampre’s Grand Old Man Chris Horner will have a definite point to prove if the bad injuries he suffered in a training incident do not hinder him. Sprinting is enjoying a real boom time at the moments with Cav’s dominance being seriously questioned, first by Greipel in 2012 and then by Kittel in 2013. Crashes and echelons have meant that we have had very few denouements with all three going hell for leather. Cav knows he needs to shine again now to take his record into the stratosphere but whether his head will be right will depend enormously on what happens on Stage 1. If Cav is slighted here and misses out on the yellow jersey due to something other than someone else being quicker in a fair contest, he could conceivably sulk for the rest of the Tour. Journalists – you have been warned! This entry was posted in Pro cycling, Uncategorized and tagged blubberhouses, buttertubs, cavendish, contador, Cycling, froome, grand depart, hautacam, Pro cycling, Tour de France, tourmalet, valverde, yorkshire. Bookmark the permalink. Graham Watson ‘Eyes on Le Tour’ photography exhibition. Yellow Fever. Tour de France.